Hirakud Dam (HD) in Orissa is the largest earthen dam in the world. It is a composite structure of earth, concrete and stone. The reservoir was built on Mahanadi River and located about 15 km upstream of Sambalpur, town. The project was the first multi-purpose river valley project in post independent India, the major motive being to control flood, irrigation and power generation [1, 2, 4]. The foundation stone of the dam was laid by Sir Howthrone Lewis on March 15, 1946 and on January 13, 1957 the first prime minister of Indian republic Pandit Jawaharlal Nehru inaugurated the dam site. During the famous inaugural speech, he called the project as the ‘the temple of modern India’  For this project around 26,561 families of 369 villages were forcibly displaced. Among the total displaced 12,700 families are scheduled caste (SC) and scheduled tribe (ST). Due to lack of proper rehabilitation and suitable compensation, many of the displaced families settled in many parts of the Sambalpur and the neighboring districts. Many migrated to other states like Chhattisgarh and Jharkhand. Around 11, 000 families were settled in the fringe of the Hirakud Reservoir . About 12,056 families got some form of compensation and about 9,944 families yet to get rehabilitation and compensation packages. Affected families are protesting for their due compensation and rehabilitation packages since the project was conceptualized  Although in the original plans there is no provision for water for industrial purposes, many companies have recently got permission from the concern authorities to dig wells in the reservoir area to draw water. Millions of farmers in Orissa who depend on Hirakud dam water to irrigate their agricultural land believe that diverting water for industry will severely affect their livelihood. In different stages, the Orissa Krushak Sangathan, a state based organization, has agitated on the issue of water distribution and priority to industries. They sent collective letters to the president of India, blocked roads (on 26th Oct ‘06, around two thousand farmers formed a human chain on a main road), called for an open dialogue with the local political leaders and embracedd "non cooperation" protests. However, they got very little attention and were targeted with violence by police forces. 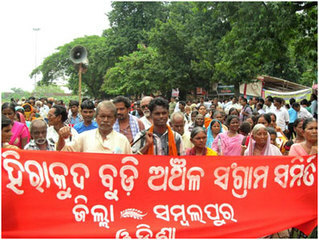 Due to displacement, since the time of early construction, different traditions and cultures of the people of western Orissa were severely affected. On top of this, the significant divertion of water to industries is putting livelihoods of thousands of farmers and fishermen at stake. After 50 years, one might ask what people gained form the dam. Many families have never seen any form of compensation, and the ecology of the river has been put at great distress. Project Details The multi-purpose Hirakud Dam constructed across the river Mahanadi. The aim of this project was to control flood, supply water for irrigation purpose and hydropower power generation. The construction of dam was started as in 1940’s. The first notification for the land acquisition was issued on 13 September 1946. Initially the notification for acquisition was issued to 95 villages . The dam is the longest earthen dam in the world. Main dam is 4.8 km spans between two hills. It is further extended by about 21 km long earthen dykes, both on left and right sides. The catchment area has formed the biggest artificial lake in Asia with reservoir spread of 743 sq. km at full reservoir level. Land for housing and other purpose for every displaced family. Compensation to each and every affected family. The dam should be kept pollution free and be given to agriculture purpose only. The people who are opposing the water use by the industries demand the right of reservoir’s water should be given to the farmers for agricultural purposes. They are pressing that no other activities will be allowed beside agriculture from the dam water . Why? Explain briefly. Displacement and rehabilitation of the Hirakund Dam has been a major issue in Orissa politics since the 1950s. About 1.5 lakh people were affected by the Hirakud project. Initially it was estimated that, the project will submerge about 240 villages with fertile agricultural land of about 42,000 hectares. A total of about 26,561 families from 369 villages were affected and displaced. Although, 7,000 families affected families have been resettled in 17 rehabilitation camps and neighboring villages. Many of them are yet to get any form of compensation. Even the initial compensation paid to the limited number of people was inadequate. The land acquisition act at that time was not a suitable instrument for claiming compensation to the concern authorities. Since the starting of the construction of the project, the government of Orissa along with the local administration has been promising to look into the grievances of the displaced people. However, no concrete steps had been taken so far .